Get the best ride quality out of your lifted truck with a set of BDS NX2 Nitro Series shocks. 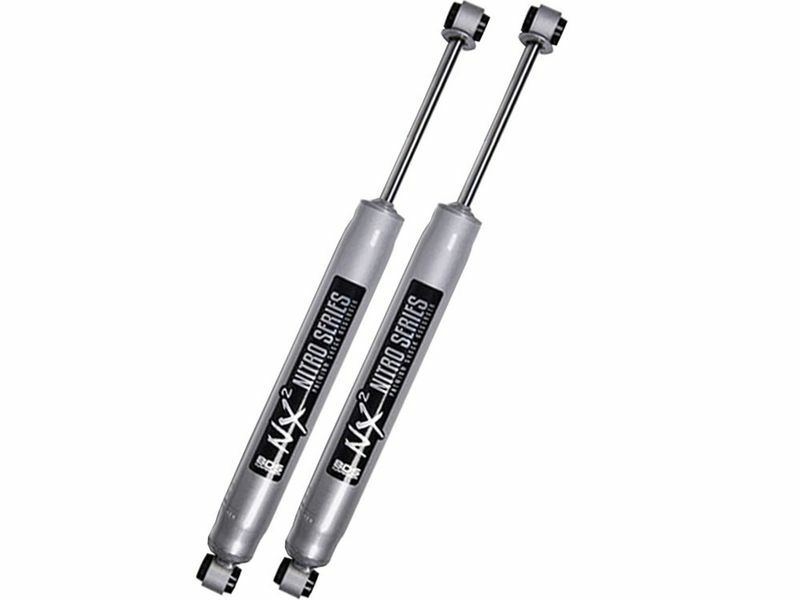 NX2 Nitro Series shocks are a high-end performance nitrogen twin tube shock that will help restore the ride quality of your lifted truck or SUV. BDS Nitro Series shocks are specifically valved for your truck and they will give you a sportier, more responsive feel both on and off road. The 10-stage velocity sensitive valving provides lightning fast dampening for whatever terrain you are tackling. These shocks are sold individually in a variety of configurations to fit a multitude of vehicles - front, rear, and even dual shock applications. BDS NX2 Nitro Series shocks are finished with a durable silver finish that fits in nicely with any color scheme you may have. Get your BDS NX2 Nitro Series shocks and give yourself a comfortable ride, on and off-road! BDS Suspension warrants to the original retail purchaser that NX2 shock and stabilizer cylinders are free from defects in material and workmanship for so long as they own the vehicle. Excluded from this warranty are the finish of the product and mounting bushings. Defects in material and workmanship do not include such things as dented cylinders or bent rods caused by obvious side impact, rust, worn or deformed bushings. A shock absorber is a wear item and over time will experience diminished damping resistance due to normal component wear. This is not a defect in material or workmanship and is therefore not warrantable. Shock oil seals are subject to wear over time, and use. Therefore are not covered under warranty. However leaking shock seals less than one year from date of purchase, free from contamination, damage, or abnormal seal wear due to misuse can be considered for warranty. BDS Suspension's obligation under all warranties is limited to the repair or replacement, at BDS's option, of the defective material. Any cost of removal, installation or reinstallation, freight charges, incidental or consequential damages are expressly excluded from these warranties. Adding or replacing your existing shock absorbers with a new set of NX2 Nitro Series shocks is a fairly easy process, you don't have to be a mechanical wizard. If you have questions or need help, give us a call, we're here 7 days a week for your convenience.